To read Us Weekly is to read not just about celebrities, but celebrities who flaunt. Nearly every day, the site publishes an article about one of them walking around this planet flaunting something, from a baby bump to a boyfriend. The use of the word has become a bit of an in-joke among the site’s commenters, as well. They make fun of “flaunt” when it appears and mockingly ask where the word is when it doesn’t. But who’s doing the flaunting, and what, exactly, is being flaunted? First, let’s break it down by gender. Of the 106 celebrities who flaunted over those 12 months, 99 were women and 7 were men. This should surprise no one who reads Us Weekly. So let’s move on. What were these famous people flaunting, anyway? The most common thing for a celebrity to flaunt was their body, which I used as a catch-all for general, nonspecific references to the entirety of one’s flesh and bones. This included terms such as “bod,” “frame,” “beach bod,” and “figure.” When individual body parts were called out, they received their own category. The second-most flaunted body part was the elusive baby bump. 14 instances (two of which were from Kristen Bell) of baby bump flaunts! And baby bump tied with legs! Famous people were flaunting their baby bumps as often as they flaunted their legs. How odd. Cleavage came next with 12 instances (this was my predicted winner among the individual body parts), and was followed by assets and curves, which tied with 11 each. I believe Us Weekly used “assets” in reference to breasts or butts, but because it was never made clear, I kept the term as its own category. Maybe, to Us Weekly, the most important assets are intangible! Maybe they were referencing the celebrity’s spirit! Who the hell knows. Assets, Fake - Jennifer Aniston, while wearing inflatable cleavage. Phew. OK. Now let’s move on to the celebrities who did the most flaunting. Kim flaunted her cleavage most, with four instances in 12 months. She also enjoyed flaunting her curves and assets, though I remain uncertain as to what assets even are. 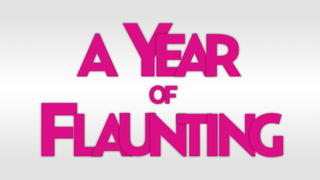 Here’s to another year of flaunting, Hollywood! After all, to flaunt is to be.